With all the hocus-pocus charlatans who claim supernatural gifts nowadays, it's easy to become cynical when you hear a report of a miracle. You'll have to watch him tell the story for himself. Click here for the page that tells about his current condition, and make sure you don't miss the video of him sharing with his church about it. Harbingers of Hatred for Christians in the U.S. I published another short blog entry a few days ago about the cross-carrying elderly woman who was harrassed by homosexuals. Since then I've learned of two other recent attacks on U.S. Christians which were even more violent. Some Christians recently began going to a downtown district of San Francisco at night to pray and worship God publicly. They were not even preaching or evangelizing. One night it got ugly. Read the story here or watch a woman tell about it on the video below. While I may have some theological differences with the Christian group the woman is part of, I am nonetheless impressed by their love for Jesus and for homosexuals. The last half of the video above (after the woman's testimony) contains footage of the homosexuals shouting, etc. Here is a clearer copy of that footage. The other attack was carried out on Mount Hope Church in Lansing, Michigan on November 9th, when about 30 anarchists disrupted the Sunday morning church service, accusing the church of being an "anti-queer, anti-choice radical right wing establishment". Please read about it here. In the end though, we probably have less to fear from our violent citizens than from the clean cut, articulate men in suits, such as this news commentator, Keith Olbermann, who provide the pseudo-intellectual foundation for disobeying God. His closing words are particularly tragic. Tony Miano does a great job on his blog answering the arguments put forth by Mr. Olbermann. If persecution comes to American Christians, may it only inspire us to love Jesus and love our enemies more than ever. Dad read us an article during lunch today. It sets the record straight on how Godly the Pilgrims really were. An example to all of us. Click here to read it. Thanks to a friend in China, I recently learned about a handy tool for taking custom-sized screenshots. As you probably know, you can take a screen shot by simply pressing the "Print Screen" key. But this captures the entire screen, which often includes far more than you needed to capture. 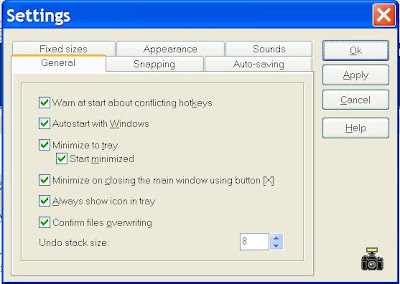 Enter MWSnap, a small piece of freeware which allows you to press a button and simply draw a box around the part of the screen you want to capture. You can then simply paste it into a document or email, or save it as a JPG file. If you are an inexperienced computer user, this is probably something you don't need. But for those who do... you can download it from Tucows. For example, here is a screenshot of my MWSnap settings page. It's a handy tool if you want to be able to show people what you see on your screen, either to help them or to ask for help from them. I first met Karl Borman last year when I did a brief presentation for VOM at the church where he is assistant pastor. He struck me as the quiet, friendly, solid, dependable, content-to-be-behind-the-scenes type guy, ideal for an assistant pastor, and hardly at the top of my list for people whom God needed to break. Last week I got an email from him after he stumbled upon my blog. It turns out that he's now got a blog of his own. God has done a major work in Karl's life. The best way for you to find out about it is to watch him tell the story in his own words. I regret that I was unable to find a way to embed the video directly into my blog, but you need to visit his blog anyways, so this will give you a good reason! Click here to be taken to the video on his blog. But don't forget to come back to read the rest of what I have to say! What has impacted me perhaps as much as Karl's testimony is seeing what God has done in his children's lives through breaking Karl. Both his children now have blogs which I also urge you to examine. Ask yourselves how many children this age you know who are this in love with Jesus. It shows the powerful ripple effect that occurs when God truly breaks one man. May God grant the Borman family grace to continue to walk humbly with their God, that the ripples may continue to change the lives of those who know them, including me. Just learned about a handy blog tool that allows me to easily post book recommendations. You'll find my Shelfari "bookshelf" on the right hand side of my blog or you can click the picture below. I'm not sure whether this elderly woman's idea was wise (what did she expect them to do when she showed up with a large cross?) but she certainly has my admiration for the courage she displayed when confronted by a mob of angry homosexuals. If you don't see the embedded video below you can click here for the direct link. You have to watch a brief advertisement before the news clip plays. Yesterday it was my privilege to speak for the persecuted church in my church's observance of the International Day of Prayer for the Persecuted Church (IDOP). A careful viewing will show that my speech-writing skills are better than my speech-giving skills. Your constructive critiques would be welcome. If you can't see the video embedded below, you can click here to watch it. Finally, after two years it is finally election day, and tonight I will sleep well no matter who wins. Tomorrow if it is like 2000 an we don't know who the next president is, I will still sleep well. Why is that? Because I know that God is in control. The following is the transcript of a five minute message of encouragement that I gave at my church a few weeks ago. In 1949 China declared itself a socialist state with Mao Zedong at its head. But Chairman Mao did not want to be another two bit dictator, he wanted to be China's God. He demanded everyone to speak his name in reverent tones, everyone was to say a prayer to him and thank him for their food, when they had food. He was to be worshiped as the great savior of the nation. The Christian church in China was in deep trouble. There was little growth relative to the population approx. 800,000 to 1 million at the most, and it was full for heresy, modernism, new ageism, and mysticism. Basically it was in need of a through cleansing. Many stumbling blocks prevented the spread of Christianity through out mainland China. The first being Travel. Chairman Mao set out to have roads built, and pretty soon what once took missionaries 7 to 9 months by donkey, could be done in a few weeks by bus or train. The nation was also divided by language, 4 races, 57 tribes, 300 languages, and thousands of dialects. Mao made mandarin the official language, all business, education, and public conversation must be done in mandarin. He also had the language simplified from 37000 characters the much more realistic amount that it is today. The nation was also 94% illiterate, he mandated learn to read or pay the consequences. He then set out to purge the nation of all religions, Christianity, buddhism, muslim, taoism, confucinism, and all other pagan beliefs. His Red Guard burned books, tortured, imprisoned, and killed followers. The only publically recognized messiah was Mao. A population that was used to keeping emotion to themselves and shunned public displays of emotion were suddenly publically confessing their sins and weeping in repentance. Mao created a unified nation. But it was only unified on the surface, under the surface their was an atmosphere of painful uneasiness, anxiety, a sense that everything was out of control. Nobody trusted anyone, every evening there ware compulsory rallies that lasted all night long glorifying Mao. The people were exhausted and had no energy for anyone or anything but Mao. Life became empty, pointless, meaningless, and hopeless. And at that point China became ready for conversion. That tiny group of believers, based mainly on the coastal regions, was not beaten down by persecution, but was strengthened by it. There are now more members of the underground Church in China, than card carrying members of the Communist Party. the best estimates are 20 to 30 thousand new Christians being added to the ranks daily. Christianity is no longer looked at as the religion of the west by the Chinese, but as the religion of China. Chinese Christians are now leaving China and preaching to the rest of the unchurched regions of this world. The nations of North Africa, the Middle East, and the rest of Asia. Now I ask you, who was in control? Was it Chairman Mao who was playing God, or was he just being played and God was and is in control. Many people are saying that this is the most important election in our lifetime. Keep in mind that they say that every four years. No matter who wins God is in control. God has a plan and it is moving forward. God's plan is greater than any presidency, or political campaign. God's plan is greater than any Governors race or initiative measure. God's plan is greater than any of man's plans. God's plan in moving forward and it won't be stopped. Whatever man tries to use or do for evil, like what Mao did, God can turn it around and use it for good. The Lord will not be stopped. 1. China's messiah chairman Mao eventually died, three days after his death, he stayed dead. To this day he is still dead. Jesus however still lives and rules in heaven. 2. I am not saying that whoever wins, or whatever party has control, has God's stamp of approval and endorsement. All I am saying is that God's plan will move on no matter who wins. I am also not saying that voting is not important, I will vote and you should to. The revival that happened in China, is happening in the Middle East, praise the Lord. History Repeats Itself: Martin Luther "on war against the Turk"
On Monday I was made aware of a fascinating aspect of history I had been somewhat ignorant of. Our world has already faced one round of the "war against terror" and it happened about 500 years ago! We forget that Muslims came very close to totally conquering Europe then. Martin Luther wrote that "the Turk is the rod of the wrath of the Lord our God", punishing Europeans for their polluted Christianity (sound familiar?). Here's where you can read his full treatise, "On War Against the Turk". Because of the great turmoil, he thought that the coming of Christ must be very near. He urges serious repentance among Christians as the first step in winning the war. Secondly, he gives advice on how military action should be undertaken against the Turks. He had a very balanced perspective which recognized the dual need for both prayer/repentance as well as military action--neither alone. The parallels are simply stunning. It is interesting to note that as the theology of Luther (and other Christian reformers) gained ascendancy in Europe, the influence of Islam waned in Europe. Bottom line: if we are going to avoid becoming Islamized we must be truly Christianized. We need another Reformation, starting with real repentance. I said, "Don't worry, it's probably still in my wallet." It wasn't. Then I said, "It must be in the papers on my desk." It wasn't. It wasn't in my pockets either. Then I remembered the lesson Dad has taught me from childhood: when you lose something, ask God to help you find it. "Lord, we ask for your help finding that paper." I turned around. There was a paper on the floor between my desk and Mom's desk. It was the receipt! Why we hadn't seen it earlier, I have no idea. But why is it that I get more worked up looking for lost papers than I do for lost people? Jesus point in Luke 15 was how excited God is when sinners repent. "The Son of Man has come to seek and to save that which is lost." (Luke 19:10) May Your priorities be mine, Lord Jesus. I've tried passing out tracts at various public events in the past. I got the idea (hopefully from God) to try passing them out to people who came to vote at our local polling place today. I arrived at about 7 AM. First hurdle was finding a legal place to pass them out. There were signs at the 75 foot mark warning that being inside that limit for any reason other than voting was a class 2 misdemeanor (called "electioneering"). Fortunately, the layout of the polling place's parking provided me with an ideal place to stand, well outside the limit. As new people drove in, I held out an "America, America" tract to them. Most rolled down their window and took it -- a few drove on by. There were fewer people than I expected. In the two hours that I stood there, I only distributed 100 tracts. However, 100 is better than zero, and I still enjoyed my time there. During the quiet spaces I thanked God for the privileges of voting and prayed for His mercy on this once-great nation. May go back and pass out some more later today. Paul Washer delivered a stirring, heart felt, passionate, 2 hour sermon at the recent Revival Conference in Georgia. In it he enumerated 10 critical deficiencies in today's American church. While he spoke very severely about some subjects, he did it in a spirit of love and grief, not anger and condemnation. Watch, listen, read, or download for free at TenIndictments.com. (Or use the embedded video below.) You don't hear many messages like this any more.